I hear from way too many freelancers, and even people running small businesses, about messes they’re in because they didn’t sign a contract with a client or vendor. And I am here to tell you, as a freelance consultant who signs a lot of contracts, DocuSign is an incredibly useful way to make sure that never happens. 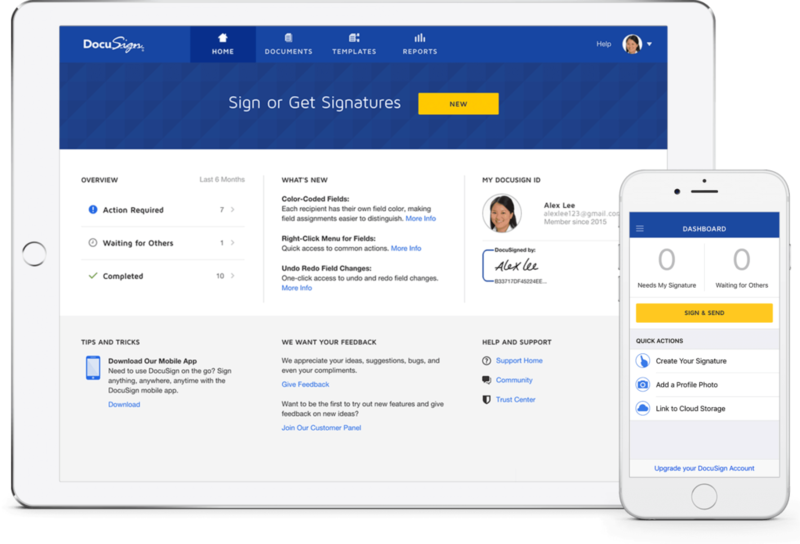 You can get a free 30-day trial of DocuSign by signing up here. Disclosure: This post is sponsored by DocuSign and is produced in partnership with influencer marketing agency Mediakix. All thoughts and opinions are my own. 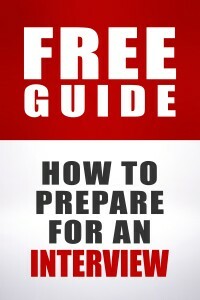 Thanks for this – if and when I start my own accounting practice, I will absolutely be using this where I can. The tax authorities don’t accept electronic signatures in some cases, but certainly for all other matters, I will be aggressively using paperless/electronic offerings. The CPA who does our taxes uses DocuSign for us to sign returns. I don’t know pluses/minuses from his point of view, but from ours it’s very easy to use. The finance company I used when buying my house used this. It was very convenient. I only had to hand sign anything on the day of closing. Yes, we used DocuSign to buy our house too. Very easy, especially since there was a lot of long-distance communication at the time. Mine too, and also my old landlord. They were both really convenient! The one feature I’d like them to add is a reassurance screen at the beginning saying “Yes, after you sign, you’ll get an opportunity to download a PDF of the document.” I didn’t know that the first couple times going through, which led to my screenshotting pictures of the lease I was about to sign… only to have it proved unnecessary when they showed a link to a PDF a little later. Worth pointing out to the commentariat here that there are alternatives to DocuSign (AdobeSign is the main competitor) and that pricing works differently for them versus DocuSign. Not necessarily a bad thing, just may not work in your favor depending on the situation. DocuSign charges per “envelope” (every time you send something out for signature) so you get charged every time you hit send regardless of whether or not it is ever signed (like you had to recall it and correct an error or something, or it expired…). If you’re likely to send a lot of documents, or likely to need to cancel and re-send documents, the DocuSign pricing structure may not work out great for you. But that’s not how the whole industry bases their pricing so don’t think you’re stuck with that if it doesn’t work for you! What do you recommend if there’s a need to sign/send lots of envelopes? That’s not how we are billed…we are charged per user, per month (on an annual basis). It means you don’t need to scan in a hard-copy as well, you just save-as to the right location. It makes things more secure than having to shred paper afterwards and saves on destruction costs for old records. If you have a business, be businesslike. And PROTECT YOURSELF. Get a contract signed. I LOVE Docusign. I first became aware of them when we were shopping for a condo. Using Docusign meant we didn’t need to sign stacks of papers to make an offer, counter an offer or do anything with physical papers until we closed escrow on the place we ended up with. Since it’s a very competitive market in Los Angeles, we made a lot of offers, so we were very happy not to deal with actual paperwork. We’ve dealt with other contracts since via Docusign, and it’s been awesome. You or the person you are contracting with can add little pointers to the areas where signatures or extra attention is required, which I find handy, too. Unless you love faxing, sending stuff by courier or mailing and waiting, Docusign is the bees’ knees. Also unlike paperwork that can be misplaced or damaged or where someone can claim they didn’t receive it, Docusign is online, undamagable and can be viewed on any of your devices. 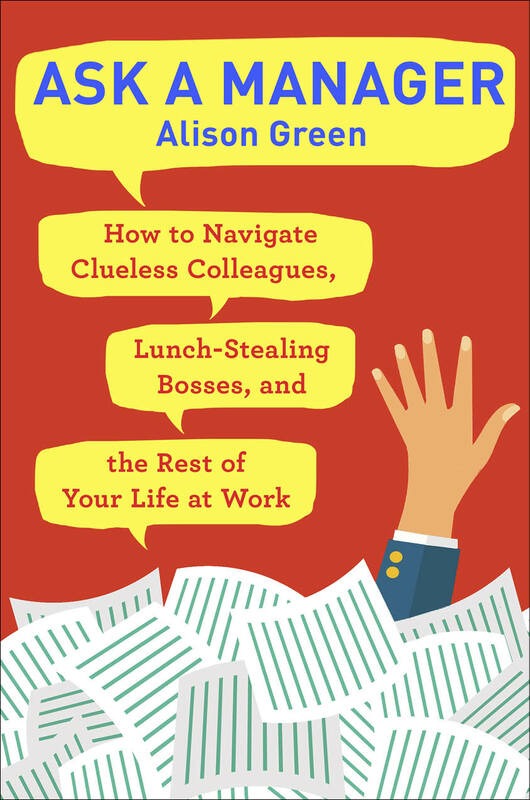 I’m not affiliated with Docusign except as a user, but when I saw Alison’s post about it, I just had to share my experiences and enthusiasm. It’s made life simpler and easier for me. Yes! I can’t believe I’m posting here to say I love DocuSign, but here I am! After using it for all the paperwork for my mortgage, I was on board. I was also subsequently very very annoyed when switching my life insurance to a different company, tried to cancel my original policy, and they had NO POSSIBLE WAY to handle it via internet. Hopefully they’ve caught up by now! DocuSign is the bomb! We use it at work all the time. 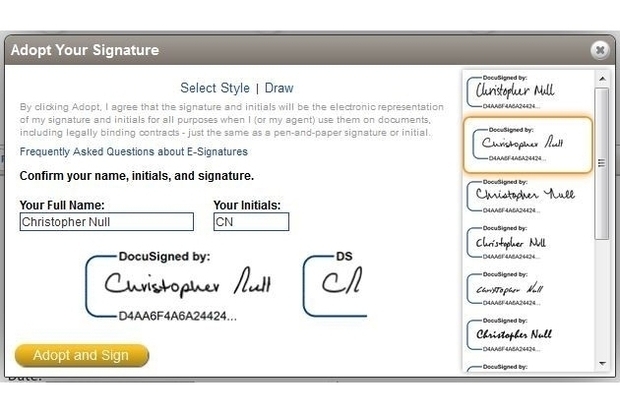 Now contract signatures are fast and easy, no matter if it’s a U.S. or international client. +1 My agency has been more successful using it internally rather than externally, but it’s been fantastic for easy return of HR documents. I love it too. Our realtor used it for all our (Canadian) real estate transactions last year and it was so much easier than figuring out where I can find a fax machine. I wish we had had this 10 years ago when I had already moved to another province and was trying to sell my house. We use it, too, and I love it. It makes it so easy to track documents and see at a glance what has not been returned to us. We use it to have our freelancers sign our independent contractor agreement and fill out a W-9 before they start. On the customer end, I like using it as well. My apartment complex uses it (if I recall correctly) for leases, and I believe we used it for the initial lease signing as well. I’m wanting to get into amateur and freelance photography, where contracts are extremely important, so I’ll be looking into this as that time approaches to avoid the hassle of physical paperwork except where it’s going to be absolutely required. I use DocuSign c o n s t a n t l y at work. It’s so much better than tracking people down in the meat space, so much faster, so much easier to collect sensitive information like social security numbers without having to sacrifice something to the one fax machine in the building. I wish to goodness that my university would adopt DocuSign or similar. We send actual pieces of paper with actual ink signatures all over campus for the most trivial things. One document I dealt with needed FIVE WET SIGNATURES for a $100 purchase. What is this, the 19th century? That sounds ridiculous, but also mirrors what my experience was working in a gov’t agency. I’m no longer freelance, but I would have LOVED THIS when I was! When I was freelance, this would have been the best money I ever spent. Genius! My company uses docusign for everything, internal and external. It’s really easy! 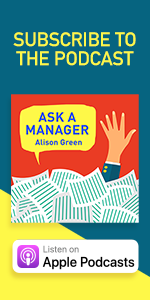 I’m a long time reader who works at DocuSign – so to add on to the plug, with some plans you can also collect payments at the same time that the contract is signed, which also guarantees you will get paid any up front work. No bonus, but they do track who comes through my link, so it will make them more likely to continue to sponsor the site. i’m legit curious, because this seems like a great tool but my experience made me really wonder! The name and the signature style aren’t identifying you; it’s the digital signature that’s more important and more secure. If you Google “DocuSign How Digital Signatures Work” you’ll get a page explaining it. I would expect some sort of PIN or login key to tie me to my DocuSign identity, the way I have for my tax verifications when doing my PSFLA recertification. So the “how does it work” doesn’t necessarily clarify things. Definitely, if I had logged in or had to store a private key somewhere, it explains it for me. I love the idea of DocuSign for initialing things or signing off reports, and it was really nice to use for the house buying process, don’t get me wrong! I’m just not sure I understand how it could work like it says, based on my experience. It pretty much works on the assumption that only you have access to your email account, so the person clicking the link must be you. If you think about it, this is as secure as paper signing, for which you can change your signature any time you like unless it’s for the bank or similar. I use Adobe sign, which I love. I don’t know if you can do this on Docusign, but with Adobe sign you actually can choose to create a free account so that your signature is saved and you don’t have to re-do it every time. Thanks for the sum-up! That’s…kind of what my vague bad experience with digital signatures was about. Someone got hold of a digitally signed file and impersonated my relative using email and fax to commit fraud. (The other person is in prison, my relative is not, but it was a stressful year of trying to prove a negative. There was absolutely no benefit to my relative and a history of unethical behavior or lower level scamming from the other person, is the main thing that swayed the case.) I know that with ink signatures, you can change the way you write or someone can forge it, but I think it feels worse in digital because of the lack of personality. I just bought a home and signed all of the docs outside of closing (like my offer, counteroffer, etc.) with Docusign and liked it a lot! I love DocuSign, because it was instrumental in helping me look great in my organization for a project I led a few years ago. Without being boring about the details, we had to get 2400 customers to sign documents by a hard-and-fast deadline, and historically 10% or more would miss that deadline. DocuSign let us easily keep track of who’d acted and who hadn’t, which eventually led to every single customer signing on time, which in our industry is nothing short of miraculous. Now if we could just get corporate to use it for our internal signature gathering – they’re still married to wet-signature-with-a-blue-pen, and it really makes it difficult when you need executive-level authorizations for things! Our realtor used DocuSign for all of our house offer paperwork. It was really nice, since both Hubs and I were quite busy and could just pop online, read & sign at our own time schedule, and then fire the paperwork right back, rather than setting up meetings and whatnot, or having to scan & send. It was pretty intuitive to use from the person signing it’s perspective. Make certain you know what the legit version of this is supposed to look like. Fake DocuSigns are one of the most common phishing attempts I get at work. We use Docusign at work! It’s very user-friendly, on both our end and the signer’s end. But yes, like Need a Beach said, Docusign envelopes are a common phishing scam, so make sure you know the ins and outs, and let people know when to expect one–they shouldn’t just be opening a random Docusign envelope without prior notice. 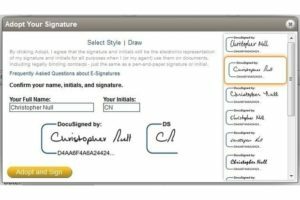 DocuSign is great for contract signatures or other things that can be created one-by-one. It’s great for house contracts and freelancers who need contract work. It is more limited for more industrial/larger-scale use. We tried to use it for acknowledgements that typically have a signature page where people sign below each other (kind of like a petition), and we found that it was a little limited in terms of bottle-necking when one person in queue hadn’t signed and adding pages for more signatures. You also have to pay extra for the bulk d0wnload tool if you don’t want to download signed PDFs one-by-one. It made my last real estate transaction so much easier and more convenient! No need to go into the office to make/accept an offer. I really love DocuSign, but find their pricing unreasonable as a small business owner. I believe the lowest package which I might be able to afford, limits you to 5 signatures which doesn’t work for me. And then there’s unlimited on the highest end of the pricing scale. The service is worth it if I could get 20 signatures a month. We use DocuSign all the time at the tax place–and the IRS has a form which is basically ‘yes, I’m really sure that signing electronically is ok with me’. There is still a place for the paper return, but I like to say it’s ‘safe, legal and rare’. The IRS is thrilled with electronic returns, because they would like to be able to see where their desk is in the morning, and the computer can take the first pass at it to make sure all the Social Security numbers and ITINs actually exist. People do look at each and every return, but most of the time that’s in summary form, and the computer helps to pick out the ‘whoa, really high expenses in This Category, let’s take a look’ and ‘are you sure they really had that much in gambling losses?’. DocuSign is one of my best buddies at work.